LAGOS, Nigeria (AP) — With marches, chants and prayers, Nigerians marked Thursday’s painful second anniversary of the mass abduction of the Chibok girls, still angry and frustrated the teenagers have not been found but hopeful a new video might lead to their safe return. 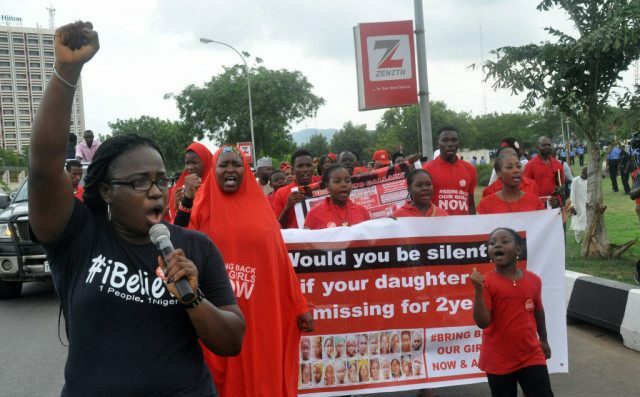 “BRING BACK OUR GIRLS NOW & ALIVE,” proclaimed a banner carried by red-shirted protesters marching in the capital of Abuja, using the phrase that made the captives a worldwide cause after their kidnap from a school in the northeastern town of Chibok by Islamic extremists of the Boko Haram militant group. 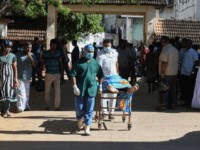 The fighters stormed and firebombed the Government Girls Secondary School on April 14, 2014, and seized 276 girls who were preparing for exams. Dozens escaped within hours, but 219 remain missing. But it was the mass kidnap in Chibok that grabbed the world’s attention. Since then, the inability of Nigeria’s government and military to rescue them has led, in part, to the electoral defeat of President Goodluck Jonathan. While much of the world has moved on, the girls are not forgotten in Nigeria, where there were marches Thursday in major cities. Hundreds chanted “We want them back!” as they demonstrated in Abuja. In Chibok, some parents of the girls joined Vice President Yemi Osinbajo, Borno state Gov. Kashim Shettima and other officials at the burned-out school to pray for the safe return of the victims. On Wednesday, CNN broadcast a “proof of life” video, believed made in December, that the government confirmed had been sent by Boko Haram in a bid to open negotiations over the Chibok girls. The video showed 15 girls, who have been identified by parents and schoolmates, wearing the Islamic hijab with one of them asking the government to keep unspecified promises. They gave the date as Christmas 2015, but it was unclear how long the government has had the video. Some of the victims have not been seen since a month after the kidnap. Chibok community leader Pogu Bitrus complained that the government had not shared the video. “It is unfortunate that they knew all these things and were communicating with the abductors but had no communication with us,” he said by telephone from Abuja. In the early days that followed the Chibok attack, Jonathan at first had denied there had been a mass abduction. International pressure soon forced him to accept help from the U.S., Britain and France, which sent advisers, including hostage negotiators. U.S. and British drones located at least one group of about 80 of the girls, which was reported to Nigeria’s government and military, but nothing was done. Andrew Pocock, who was British high commissioner to Nigeria until his retirement last year, told The Sunday Times magazine last month that a rescue was considered to be too dangerous. “You might have rescued a few, but many would have been killed,” the magazine quoted him as saying. Nigeria’s military has cited the same fears, but that has not stopped it from attacking towns and villages where Boko Haram has held thousands of captives. The military boasted last week that soldiers have rescued 11,595 civilian hostages since Feb. 26 — although none has been from Chibok. “Why has the world forgotten our missing #ChibokGirls,” tweeted Oby Ezekwesili, one of the founders of the Bring Back Our Girls campaign. In Washington, U.S. Rep. Frederica S. Wilson held a news conference to remind the world about the plight of the girls. “This is an anniversary that none of us thought that we would have to mark, because we thought by now we would have found the Chibok girls, and they would have been returned to their homes, to their parents, and we would just be fighting Boko Haram,” said Wilson, a Florida Democrat. Buhari has said that it is difficult to know whom to negotiate with in Boko Haram, a fractured group with several leaders that last year swore allegiance to the Islamic State group. Previous negotiations under Jonathan failed when it was discovered that officials were talking to people who were not credible. Any negotiations also would be complicated by the fact that the girls are believed to have been broken up into smaller groups. There also have been unverified reports of some being carried across the border into Cameroon. In January, Boko Haram offered to exchange the girls for detained insurgent leaders, but lately there have been unverified reports the extremists want millions of dollars to free them.